Heng Ah! Ong Ah! Huat Ah! This special CNY promotion will only be valid until 28th February 2018. Are you aiming to reach a higher conversion rate before celebrating CNY? You Will need OUR help! We plan, develop and strategize campaigns for your Facebook page. Helping your business customize and design relevant creative write ups for your brand. Every user on Facebook are our potential customers. Implement the right methods on Facebook that will benefit your business greatly. Most importantly, you will achieve higher brand awareness, giving your brand more publicity to thousands or millions of Facebook users. Thus, this will help triple your business profit. Are you looking for the right solution for these objectives? YOUR TIME IS NOW, LIMITED TIME ONLY! 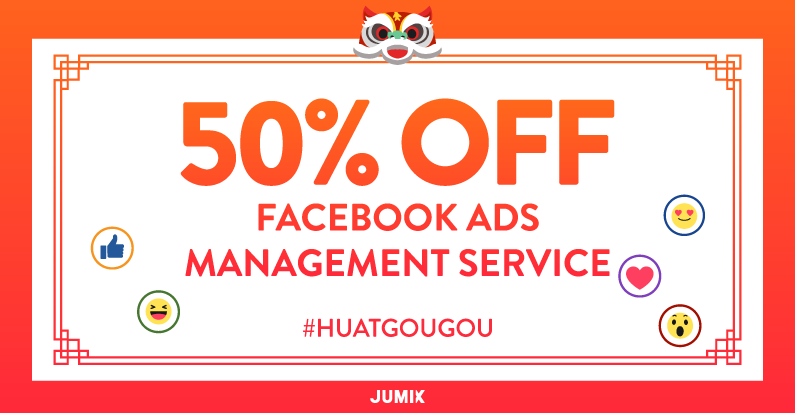 Triple your profit by signing up on Jumix’s Facebook Ads Management with your unique discount code and enjoy 50% OFF our Management fee on the first month of sign up!